Within the Landau–Ginzburg–Devonshire (LGD) theory framework, the impact of the flexocoupling and electrostriction on the soft phonon dispersion and neutron scattering spectra is analyzed, and analytical expressions are derived. The impact of the higher gradient term in the LGD functional is studied analytically. The existence of incommensurate modulations in a temperature interval higher than the Curie temperature TC, but lower than the temperature of incommensurate phase transition TIC, TC < T < TIC, and under the condition of the flexocoefficient magnitude ranging over the critical value, |f| > fcr(T), is established. The influence of the dynamic flexocoefficient M, suggested in , on phonon spectra is studied. 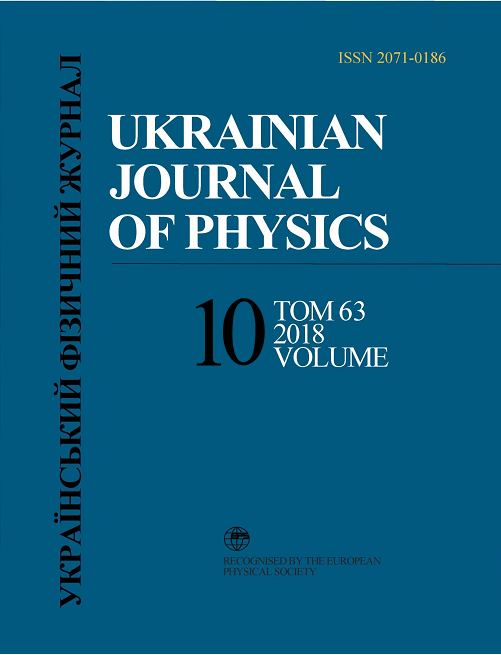 We consider various parameters of the free energy functional; especially, we have discovered a significant contribution of the electrostriction to the appearance of a commensurate phase. In the recent years, the various methods based on the neutron scattering acquire more applications to study phonons in solid crystals. We have analyzed neutron scattering spectra and shown that theoretical predictions are in a very good agreement with observed data. P.V. Yudin, A.K. Tagantsev. Fundamentals of exoelectricity in solids. Nanotechnology 24, 432001 (2013). M.D. Glinchuk, A.V. Ragulya, V.A. Stephanovich. Nano-ferroics (Springer, 2013), p. 378. V.S. Mashkevich, K.B. Tolpygo. The interaction of vibrations of nonpolar crystals with electric fields. Sov. Phys. JETP 4, 455 (1957). A.K. Tagantsev. Piezoelectricity and exoelectricity in crystalline dielectrics. Phys. Rev. B 34, 5883 (1986). P. Zubko, G. Catalan, A.K. Tagantsev. Flexoelectric effect in solids. Ann. Rev. Mater. Research 43, 387 (2013). S.V. Kalinin, A.N. Morozovska. Multiferroics: Focusing the light on exoelectricity (comment). Nature Nanotechnology 10, 916 (2015). A. Kvasov, A.K. Tagantsev. Dynamic exoelectric effect in perovskites from first-principles calculations. Phys. Rev. B 92, 054104 (2015). W. Cochran. Crystal stability and the theory of ferroelectricity. Phys. Rev. Lett. 3, 412 (1959). G. Shirane, J.D. Axe, J. Harada, J.P. Remeika. Soft ferroelectric modes in lead titanate. Phys. Rev. B 2, 155 (1970). W. Cochran. Dynamical scattering and dielectric properties of ferroelectric crystals. Adv. in Phys. 18, 157 (1969). G. Shirane, Y. Yamada. Lattice-dynamical study of the 110 K phase transition in SrTiO3. Phys. Rev. 177, 858 (1969). R. Currat, H. Buhay, C.H. Perry, A.M. Quittet. Inelastic neutron scattering study of anharmonic interactions in orthorhombic KNbO3. Phys. Rev. B 40, 10741 (1989). I. Etxebarria, M. Quilichini, J.M. Perez-Mato, P. Boutrouille, F.J. Zuniga, T. Breczewski. Inelastic neutron scattering investigation of external modes in incommensurate and commensurate A2BX4 materials. J. Phys. : Condens. Matter 4, 8551 (1992). J. Hlinka, M. Quilichini, R. Currat, J.F. Legrand, Dynamical properties of the normal phase of betaine calcium chloride dihydrate. I. Experimental results. J. Phys. : Condens. Matter 8, 8207 (1996). J. Hlinka, S. Kamba, J. Petzelt, J. Kulda, C.A. Randall, S.J. Zhang. Origin of the "waterfall" effect in phonon dispersion of relaxor perovskites. Phys. Rev. Lett. 91, 107602 (2003). V. Goian, S. Kamba, O. Pacherova, J. Drahokoupil, L. Palatinus, M. Duˇsek, J. Rohlˇcek, M. Savinov, F. Laufek, W. Schranz, A. Fuith, M. Kachlk, K. Maca, A. Shkabko, L. Sagarna, A. Weidenkaff, A.A. Belik. Antiferrodistortive phase transition in EuTiO3. Phys. Rev. B 86, 054112 (2012). Jong-Woo Kim, P. Thompson, S. Brown, P.S. Normile, J.A. Schlueter, A. Shkabko, A. Weidenkaff, P.J. Ryan. Emergent superstructural dynamic order due to competing antiferroelectric and antiferrodistortive instabilities in bulk EuTiO3. Phys. Rev. Lett. 110, 027201 (2013). R.G. Burkovsky, A.K. Tagantsev, K. Vaideeswaran, N. Setter, S.B. Vakhrushev, A.V. Filimonov, A. Shaganov et al. Lattice dynamics and antiferroelectricity in PbZrO3 tested by x-ray and Brillouin light scattering. Phys. Rev. B 90, 144301 (2014). J. Hlinka, I. Gregora, V. Vorlcek. Complete spectrum of long-wavelength phonon modes in Sn2P2S6 by Raman scattering. Phys. Rev. B 65, 064308 (2002). A. Kohutych, R. Yevych, S. Perechinskii, V. Samulionis, J. Banys, Yu. Vysochanskii. Sound behavior near the Lifshitz point in proper ferroelectrics. Phys. Rev. B 82, 054101 (2010). A. Kohutych, R. Yevych, S. Perechinskii, Y. Vysochanskii. Acoustic attenuation in ferroelectric Sn2P2S6 crystals. Open Physics 8, 905 (2010). Yu.M. Vysochanskii, A.A. Kohutych, A.V. Kityk, A.V. Zadorozhna, M.M. Khoma, A.A. Grabar. Tricritical behavior of Sn2P2S6 ferroelectrics at hydrostatic pressure. Ferroelectrics 399, 83 (2010). R.M. Yevych, Yu.M. Vysochanskii, M.M. Khoma, S.I. Perechinskii. Lattice instability at phase transitions near the Lifshitz point in proper monoclinic ferroelectrics. J. Phys. : Condens. Matter 18, 4047 (2006). A.N. Morozovska, Yu.M. Vysochanskii, O.V. Varenyk, M.V. Silibin, S.V. Kalinin, E.A. Eliseev. Flexocoupling impact on the generalized susceptibility and soft phonon modes in the ordered phase of ferroics. Phys. Rev. B 92, 094308 (2015). A.N. Morozovska, E.A. Eliseev, C.M. Scherbakov, Yu.M. Vysochanskii. The influence of elastic strain gradient on the upper limit of exocoupling strength, spatially-modulated phases and soft phonon dispersion in ferroics. Phys. Rev. B 94, 174112 (2016). A.N. Morozovska, M.D. Glinchuk, E.A. Eliseev, Yu.M. Vysochanskii. Flexocoupling-induced soft acoustic mode and the spatially modulated phases in ferroelectrics. Phys. Rev. B 96, 094111 (2017). A.N. Morozovska, V.V. Khist, M.D. Glinchuk, C.M. Scherbakov, M.V. Silibin, D.V. Karpinsky, E.A. Eliseev. Flexoelectricity-induced spatially modulated phases in ferroics and liquid crystals. J. Molecul. Liq. 267, 550 (2018); arXiv:1710.01033. L.D. Landau, E.M. Lifshitz. Theory of Elasticity. Theoretical Physics (Butterworth-Heinemann, 1998), Vol. 7. S.W.H. Eijt, R. Currat, J.E. Lorenzo, P. Saint-Gregoire, B. Hennion, Yu.M. Vysochanskii. Soft modes and phonon interactions in Sn2P2S6 studied by neutron scattering. Eur. Phys. J. B 5, 169 (1998). E.A. Eliseev, A.N. Morozovska, M.D. Glinchuk, R. Blinc. Spontaneous exoelectric/exomagnetic effect in nanoferroics. Phys. Rev. B 79, 165433 (2009). P.V. Yudin, R. Ahluwalia, A.K. Tagantsev. Upper bounds for exocoupling coeffcients in ferroelectrics. Appl. Phys. Lett. 104, 082913 (2014). S. Mao, P.K. Purohit. Insights into exoelectric solids from strain-gradient elasticity. J. Appl. Mech. 81, 081004 (2014). M. Stengel. Unified ab initio formulation of exoelectricity and strain-gradient elasticity. Phys. Rev. B 93, 245107 (2016). N.H. March, W.H. Young, S. Sampanthar. The Many-Body Problem in Quantum Mechanics (Cambridge Univ. Press, 1967). C.P. Bean, D.S. Rodbell. Magnetic disorder as a first-order phase transformation. Phys. Rev. B 126, 104 (1962).